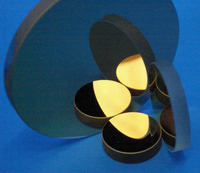 mirrors for applications where THz radiation has to be fully reflected. Typical reflection curve is shown below. Measurements were made up to 1000 μm. However operating wavelength range is much wider. Fig. Reflection od THz mirror.